Australia’s leading bus manufacturer Volgren is quickly becoming one of the great success stories for manufacturing in the country. The Dandenong-based company has been going from strength to strength in recent years, having secured an on-going opportunity to export buses to Japan, as well as a major contract to supply the New South Wales Government with 100 buses next year. 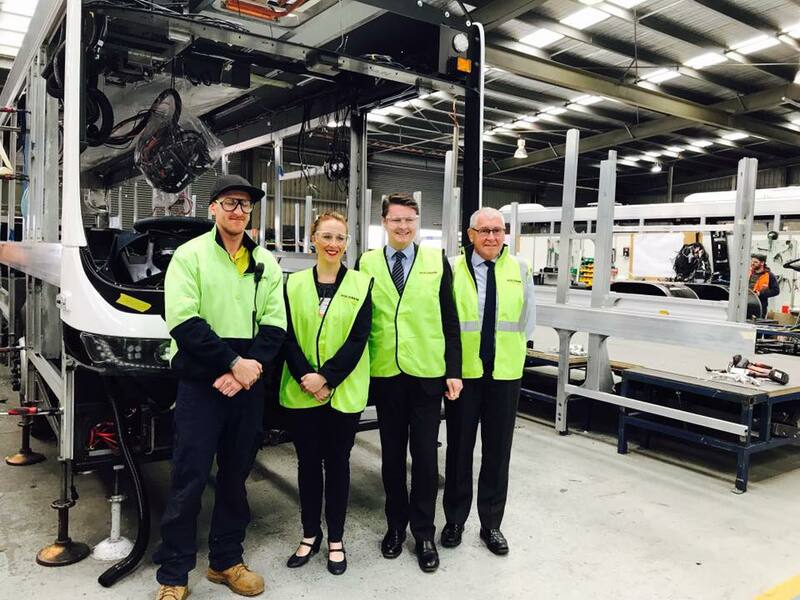 Their recent success has not gone unnoticed, and the company yesterday welcomed Victorian Minister for Industry and Employment Ben Carroll and Member for Dandenong Gabrielle Williams in their premises in Dandenong. Speaking in front of the company’s workforce on Tuesday, Mr Carroll vowed to continue backing local manufacturing through a new industry statement – Advancing Victorian Manufacturing– A Blueprint for the Future – which was established help manufacturers develop new products, improve training and skills, increase competitiveness and support export growth. He said Victoria continues to be a leader in transport manufacturing, with the sector employing around 29,000 people and contributing about $3.5 billion to the state economy each year. “Victoria has nation-leading manufacturers who are taking their innovation to the world, and we’ve got their backs,” the Minister sated. Ms Williams said Melbourne’s south-east was the heart of Victoria’s manufacturing industry, adding that Volgren was an important part of the region’s success. “We have to plan for the future of this industry, and that’s exactly what our new manufacturing statement is doing,” she concluded.